The name given to the archipelago by Micmac aboriginals is a poetic description: “Menagoesenog”, which means “islands swept by the surf”. Long before the arrival of Europeans, native people came to the islands to fish and hunt for seal and sea cows. On June 25, 1534, Jacques Cartier wrote in his logbook the first recorded reference to Les Îles. He named them “Araynes”, from the latin word “arena” which means sand. The first island he set foot on he named “Isle Margaulz”. It is now called Rochers-aux-Oiseaux, a reference to its large bird colonies. Île Brion was also named by Cartier. In 1629, Samuel de Champlain wrote “La Magdeleine” on a map, in the vicinity of Île du Havre-Aubert. But another theory has it that the name “Îles de la Madeleine” was given in 1663, in honour of Madeleine Fontaine, by her husband François Doublet de Hanfleur who had gained concession of the islands. In 1755, the destiny of the Acadian people took a tragic turn. It was the "Grand Derangement" — a mass deportation. Some who managed to avoid deportation found refuge on Îles de la Madeleine, which a merchant named of Richard Gridley ruled with an iron fist. The Acadians employed by Gridley worked the fisheries and hunted walrus. 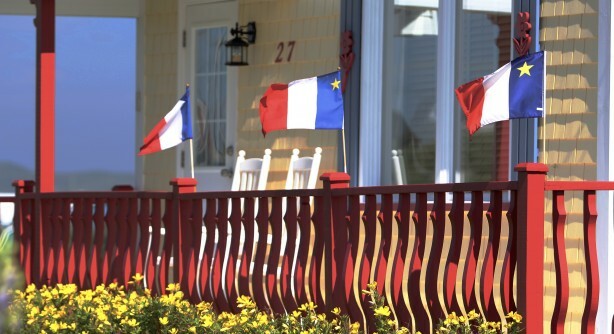 In 1789, following the French Revolution, other families came from Saint-Pierre and Miquelon. They were led by father Jean-Baptiste Allain, who created the first records of the settlement. This marked the true beginning of the colonization of Les Îles. In 1763, Les Îles were annexed to Newfoundland. In 1774, the Québec Act transferred them to Québec. In 1798, Isaac Coffin was granted concession of Îles de la Madeleine and he forced Madelinots to pay a rent to farm land they had cleared and occupied for more than 25 years. Hardship and injustice forced numerous Madelinots to emigrate. They became the founders of several villages on the North Shore of the St. Lawrence: Blanc-Sablon in 1854, Havre-Saint-Pierre and Natashquan in 1855 and Sept-Îles in 1872. Madelinots had to wait till 1895 for the Québec law that allowed them to buy back their lands. From then on, they directed their efforts at overcoming difficulties and achieving self-sufficiency. Seafarers and fishermen all, Madelinots are familiar with both the joys and the trials and tribulations of maritime life. Many tragic shipwrecks have been recorded (more than 400), and these were more often than not foreign ships swept ashore in storms while navigating past theislands. Many survivors chose to settle down and make the Islands their home. Although modern methods of communication have eased their isolation, Madelinots still maintain their unique way of life. In 2013, the population totalled 12,721 inhabitants, including the 5% of Madelinots who are English-speaking and largely of Scottish descent.